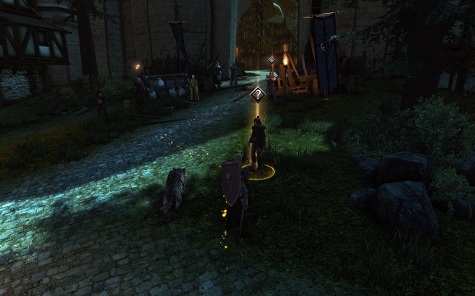 This week marks a big step in the development of Neverwinter. 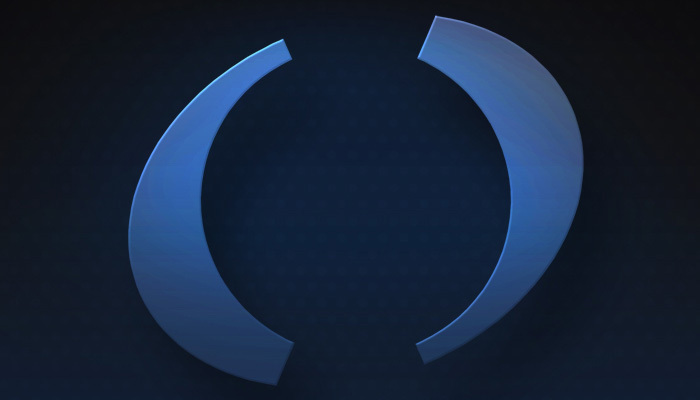 In development for almost two and a half years since being announced, Cryptic Studios and Perfect World Entertainment have kept a fairly tight lid on the project, that is, until now. The upcoming weekend will see the first beta event kick off, a time when thousands of users, fans of the Neverwinter and Forgotten Realms settings, will finally get a chance to look at the game that Cryptic has been so lovingly crafting for these seemingly long years. Prior to the weekend's more public event, Perfect World Entertainment hosted a press preview of Neverwinter and we had a full team on hand to take part. One of the things that tends to happen around the time most MMOs begin beta testing is that people often forget that the true purpose of beta testing is exactly that: To test the game. No game in beta is a finished product and it’s always wise to go into any experience with an open mind about kinks that will crop up. After happily creating my character (which I’ll talk about in a bit), I went through the tutorial and landed in the Neverwinter city proper. Finding Bill was no problem but once we grouped up and tried to use the in-game voice chat, we quickly discovered that, for some unknown reason, my Steelseries Diablo 3 gaming headset wasn’t working. I know what you’re thinking: Yes, we went through all of the possibilities for this issue I encountered but to no avail. Even later when joining our tour guide, the issue continued. The game sounds were fantastic but the inability to chat was not a lot of fun. Others in our group had periodic issues with the voice chat as well, but this is something that Cryptic is sure to get worked out prior to the game’s launch. Additionally, there were a two times when my game crashed with a critical error. Both times I was tossed out of the game, the Cryptic bug reporting system was waiting for me on my desktop and I dutifully reported what had happened. Both times I was able to reenter the game with no problems whatsoever, though had I chosen to, I could have taken advantage of the file checker. Really though, I didn’t want to wait the ten to twenty minutes it might take. 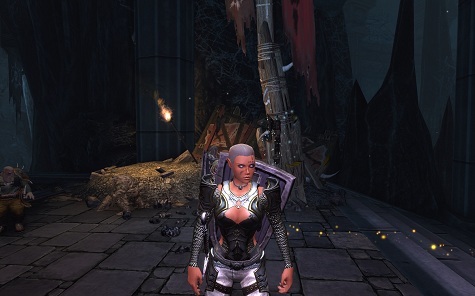 Other than those two relatively minor exceptions, Neverwinter ran very smoothly and looked great. But I’ll get back to that in awhile. Any old school D&D player will tell you that creating a character is one of the most important, if not the most important, part of any game. 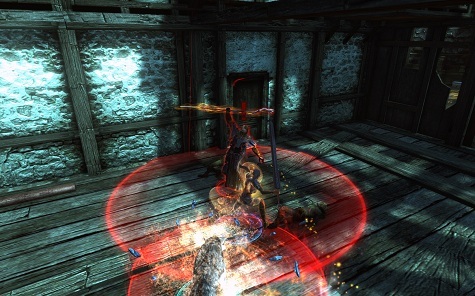 Cryptic took much of what tabletop players and Neverwinter Nights players are used to and have incorporated it into Neverwinter. For this event, we were able to choose from Human, Half Elf, Elf, Dwarf, Halfling or Tiefling races and could choose from Guardian Fighter, Trickster Rogue and Devoted Cleric for our character class. I was totally thrilled to choose a Female Half Elf Guardian Warrior. Once that piece of creation was complete, it was on to the real meat and potatoes of customization. Of course, there are presets available sporting many different looks. If getting into the game lightning fast is your thing, you can be into the city itself in about a minute. If you’re like me, you’ll want to grab one of those pre-fabricated characters and then set into customizing to your heart’s content. 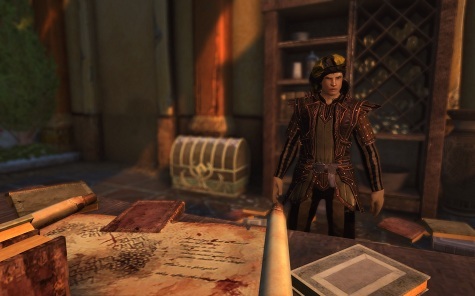 The Neverwinter character customization feature is quite simply the most robust that I have ever seen in any MMO. Cryptic has included such little-seen choices including hand size, finger/arm length, heels/no heels, neck length and much, much more. We're told that in th Foundry, you have this level of customization for each NPC you placetoo. I could have spent an hour getting my half-elf precisely to my liking but in the interest of time and wanting to be sure that I was ready when the tour began, I forewent much of the astonishing variety of options. When the character you’ve created is just right, you’re then on to your character’s background story where you will be able to choose a home city, a basic background and your Deity, all staples of the D&D experience. You'll even roll a dice to get your stats just right. Every character starts with a basic set of clothing but it is rapidly replaced through purchasing from vendors, winning armor pieces and weapons through questing or even crafting your own. Looking at the wide array of people running around Neverwinter leads one to believe that not only will characters physically look vastly different from one another, but so, too, will their clothing and armor options. While I’m on the topic of customization, I don’t want to leave out the fact that the UI can be completely customized to fit a player’s style. Nearly every box or informational screen can be hidden, moved, or resized to fit anyone’s favorite look. No two screens will ever look the same with this ability. Neverwinter is a huge city, and we're just in one district for this event. It’s worth engaging the first quest-giver’s long list of tasks in order to familiarize yourself with the city and the many locations within it. Also, the more you explore, the more of the map is revealed as the ‘fog of war’ is peeled back. Neverwinter is also breathtakingly beautiful. It is indeed a city of splendor even if in some parts of it are still in ruins after the cataclysmic events of 75 years ago or still under the control of gangs and villains. The sheer number of textures and placeable items is amazing. It took me awhile to see the same things twice. What further excites me on looking at Neverwinter is the fact that everything we see in what Cryptic has created will also be available to players choosing to build in The Foundry. It will be very special to see what builders come up with over time. As yet, I’ve not had a chance to check out some of the modules that players have created but I plan to over the first beta weekend. The ambience is just right for a big bustling city the size of Neverwinter. People do stand in small groups but they are moving, talking and gesturing rather than simply looking like statues. People are walking around the city and birds fly overhead. There is a lot of movement in Neverwinter and because of that movement, there is also a lot of sound. There are noises of carts passing, footsteps of passersby, vendors hawking their wares. In short, you hear all of the things you would expect and the city feels alive because of it. Even the dungeons and sewers of Neverwinter have their own peculiar beauty with black sludgy water pouring out of pipes, piles of rubbish underfoot, collapsed walls, ember-laced beams from recent fires, skeletons of would-be adventurers who didn’t quite make it, even goods hauled to the smellier places in Neverwinter by gangs of thieves. 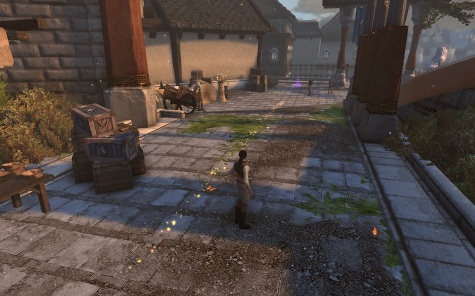 Cryptic has put a lot of effort in making Neverwinter as varied as ever described in any Forgotten Realms game or book. You’ll be hard-pressed to find many places where the same decorative touches have been used more than once. It’s a rare and unexpected treat. I’m going to start this section with the statement that Neverwinter is heavily instanced. The city, while enormous, begins to feel quite small as adventurers are sent off on quests that are generally fairly near and almost always within an instance. For me, this is not a bother but there are those who will abhor the way that Neverwinter plays out and who will probably bemoan the fact that NW is not an MMO or some other nonsense. While I will respectfully disagree with that notion, I can understand it. The instances I passed through while questing were pretty short all in all but, again, the look and feel of each was unique so as to take the edge off the quick run through. Each instance is packed with traps and trash mobs though there are some very tough guys scattered among them like Battle Hardened Goblins and casters that can be very difficult to take down. Even seeing the ‘telegraphed’ area of spell effect is no guarantee of survival. Massive physical or magical attacks H-U-R-T. Just ask Bill how many times I died in our dungeon adventure. Finding adventure partners is pretty easy though the control system will take some getting used to. For instance, joining a group after receiving an invite requires “shift + 1” to be pushed. It’s not difficult, just different. You can press alt to get control of your mouse, but it's quicker to use the shortcuts. The one aspect of partying that I found troublesome is how difficult it is to find your groupmates. While party names will appear in blue, I found the markers on my mini-map to be woefully small, making getting into the same location problematic at times. Additionally, entering into an instance won’t pull party members from wherever they are on the map. All need to be gathered at the entrance, something I actually quite liked. None of that Guild Wars 1 run through the mountains stuff here. Questing can be as hard or as simple as one prefers. Cryptic has provided players a handy glowing pathway to quest locales that, for the purists, be toggled off should a player choose to forge his or her own path. Making it an optional thing was a brilliant stroke and will appeal to both sides of the “led by the nose” issue. When grouped in a party, the loot parameters can be chosen by the leader. In our group, we utilized dice rolls to see who would win items dropped by some monsters. Additionally, players receive their own rewards in the end-of-instance chests on completion of any given quest. It’s a nifty way to include both types of loot systems. Lastly, gold...ah gold. Luckily, there is a no muss, no fuss way to pick up gold: Simply run over it and it’s put into your wallet. Any party member can run over a pile of gold and it’s split among all members. No more click the gold pile! WHOOT! Bill, Garrett and I will be covering combat for each class in each of our class-specific articles so keep an eye out for those! But if you haven't read already, know that tab-targeting is not in Neverwinter. Instead, all combat takes on a much more "shooter-like" approach, that folks who have played TERA might be familiar and comfortable with. 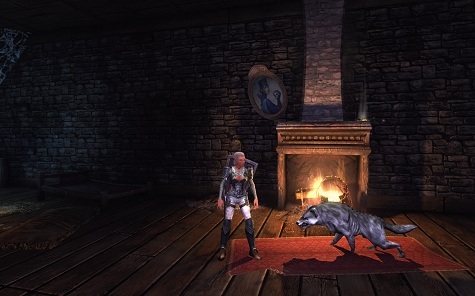 It’s difficult not to be excited by Cryptic’s Neverwinter. There is so much riding on its success and, honestly? I can see it happening. If the thought of an instanced MMO isn’t offensive to you, there’s no question that Neverwinter will be the game to play in 2013. In addition, those with an artistic storyteller’s heart will want to give The Foundry a try as well. Only good things can come from that, guaranteed. Cryptic Studios has created something that should bring RPGers and MMOers together in a unique pretty much never-before-seen way. 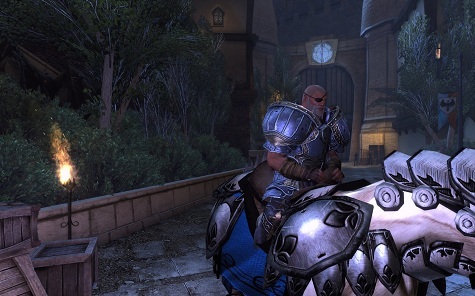 While there are things that need to be ironed out and improved upon, I believe Cryptic will make good on the promise that Neverwinter brings to the genre.